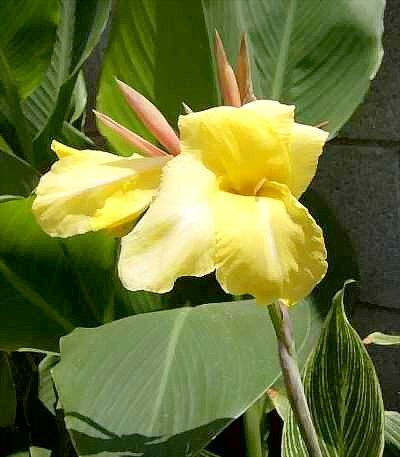 Canna 'Bangkok' has yellow flowers with a white stripe down the center of the petals. 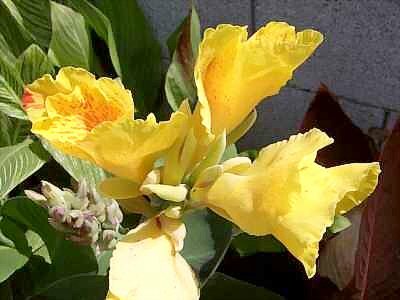 Bangkok's flowers are very beautiful and delicate. Unfortunately they do not hold up well under the desert sun. I felt fortunate to catch this lovely flower in a pretty good light. The foliage is a different story: it always looks great! I can understand now why some gardeners cut off the flowers and just grow Bangkok for the vigorous and dramatic foliage. Not that I would do that, mind you! 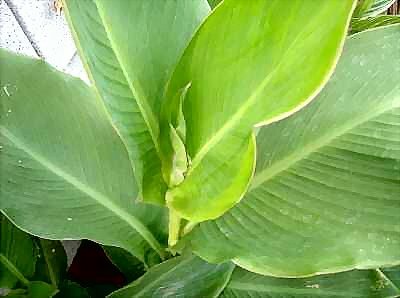 Bangkok has numerous synonyms - different names for the same plant. They include 'Striped Beauty', Christ's Light', 'Nirvana', 'Minerva' amd 'King of Siam'. Make way for the pathway garden! 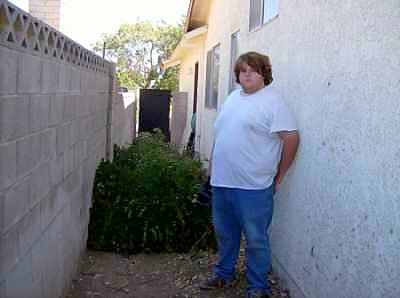 Unsightly overgrown bushes have been removed from the narrow, east-facing side of the house. My son heroically removed these obstacles to progress. 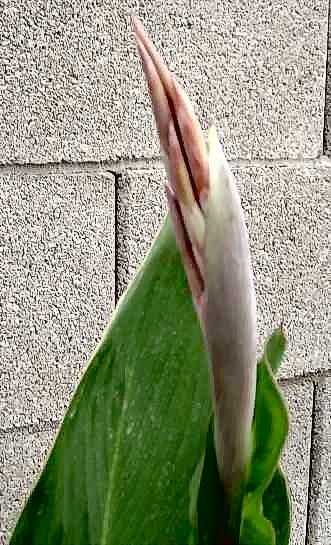 I am planning a pathway garden that will include cannas and other lovely things. 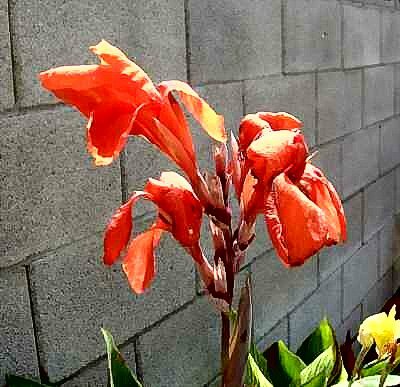 These are the first blooms of Cleopatra. 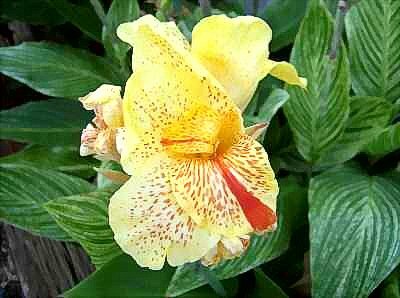 They are lovely bright yellow with red spots. The buds of Cleopatra are randomly colored green, purple or both. Cleopatra is a chimera. 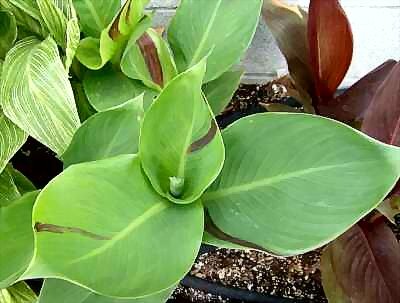 That means that there are two different sets of genes within the plant tissue that cause the striped leaves and harlequin flowers. 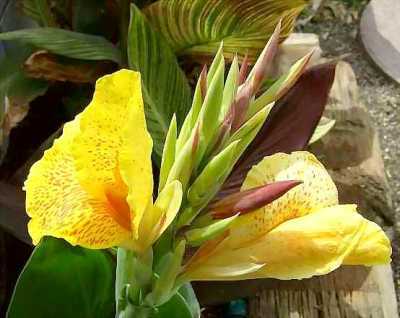 Lovely brown and green leaves are a predictor for lovely yellow and red flowers. 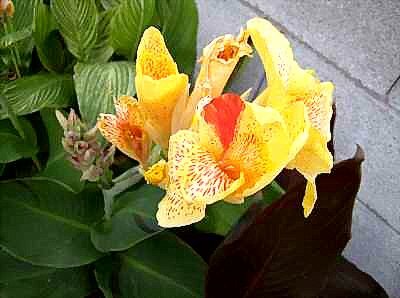 Cleopatra is unstable, so that no two flowers may look alike. 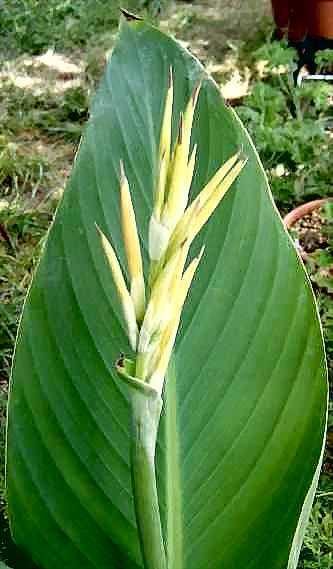 Completely green shoots will create solid yellow flowers. 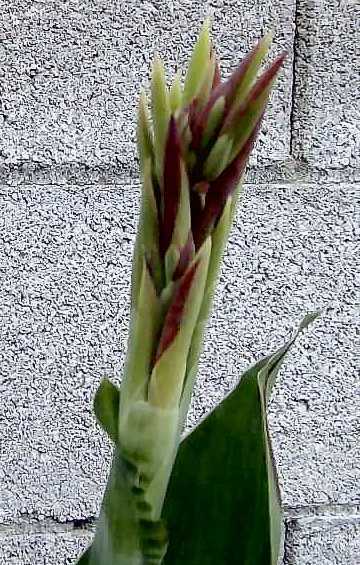 Brown shoots will have all red flowers.